In this combined data and documentary analysis of Portland’s response to houselessness, we examine how our public complaint-driven reporting system informs street evictions, or ‘sweeps’, which cause repeated harm and trauma to those who are evicted and displaced. Our analysis looks at how policies and inflation of crime statistics affect trauma, waste, and barriers to stable housing. We suggest alternative, evidence-proven programs. While it is not a crime to be homeless, our city and state have established 224 laws that inhibit those living on the streets from performing necessary life-sustaining activities in the public spaces, including: erecting a tent, covering possessions with a tarp, sleeping, washing, caring for one's body, or relieving oneself outdoors. Retail stores, eateries, and offices exclude neighbors experiencing houselessness from using indoor bathrooms and showers that they offer to housed Portlanders (Hawash, Goes Behind, Kimball, 2016; Harbarger, 01/15/2018; Wicks, 03/03/2017). Likewise, the City of Portland offers no reliable waste pick-up services to those who live on the streets, yet may fine houseless neighbors for the household waste they and housed individuals dispose of in nearby public places (Dooris, 11/13/2018; Green, 11/9/2018). From 2017 to 2018, the number of unique campsites identified by the City's "One Point of Contact" program has remained relatively unchanged at around 110 camps each week. However, the number of public complaints about street camps has risen to well over 600 reports a week as of October 2018. City eviction and seizures targeting that steady number of campsites have increased as well, as shown in our next graphic. The City of Portland increased evictions on properties under its jurisdiction to a peak of 311 in October 2017. By 2018, the number of sweeps is more constant, with at an average of 42 campsites swept per week in 2018 (January-November, at the time of writing). According to an estimate from the public campsite reports, the average number of campers involved in a single eviction is 4 residents per site. Using this data we estimate that every week the City of Portland uproots an average of 168 Portland residents from their homes and communities. This translates into the weekly eviction and dispossession of over 10% of the entire unsheltered homeless population in Portland (Krishnan & Elliot; 10/2017). WHAT ARE THE HUMAN COSTS OF SWEEPS? It is important to remember before we begin that many of our neighbors living on the streets make homes for themselves that are delicately woven together with strong bonds of friendship and support. These help them survive the physical and psychological hardships of what one informant likes to call "thin walls." These communities and bonds are firmly rooted in physical space. People gather together and cooperate to access and share food, survival gear, and information about where to get help of various kinds in their surrounding areas. These physically rooted networks of support are drastically disrupted when the City literally tears them apart during sweep-evictions. People need stable places to develop friendships, do their art, get to jobs and school, care for their pets, and attend critical health and housing appointments. These are depicted in pictures 1-3. Sweeps ironically lead to more trash, trauma, and higher barriers to entering stable housing. They destroy the small modicum of peace and home that people strive to make for themselves. WHAT IS THE CITY-WIDE MAGNITUDE OF SWEEP-EVICTIONS? In 2017, our city evicted 1,377 camps, and from January through October of 2018, 1,845 camps were evicted. 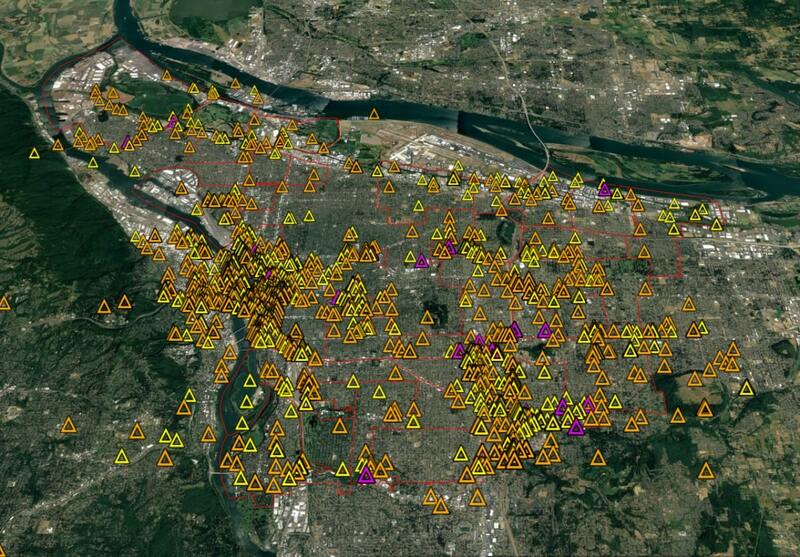 Use the menu below to visualize the magnitude and location of sweeps across different neighborhoods in Portland (pink: 2016, yellow: 2017, orange: 2018). To understand sweep-evictions at a neighborhood scale we subset the sweep-evictions to within the boundaries of Hosford-Abernethy, Buckman, and Kerns. These are the neighborhoods that contain the 77-block area of the Central Eastside Industrial District, several areas of which are swept on a regular basis, as part of a City-described "maintenance project" that refers to sweeps that regularly occur in a single location. The Central Eastside Industrial Council is proposing a self-imposed tax to create an "Enhanced Service District" that they are requesting approval for on January 17th. In the last year, a vocal minority of Portlanders have requested increased policing and private security forces based on claims that (a) that the City and particular neighborhoods are experiencing an increase in person and property crimes because of inadequate resources allocated to policing, and/or (b) that the City is not allowing our police to fully enforce our laws with residents who live outside (Schmid, 12/29/2018; Zielinksi, 10/11/2018; Cook, 05/4/2018; ceic.cc; Sparling, 09/19/2018; Bailey, 9/19/2018; montavilla.org). 52% of arrests in Portland in 2017 were of houseless neighbors -- mostly for procedural and low-level crimes. They represent just 3% of the population (Woolington, 6/13/2018). The Central Eastside Industrial Council (CEIC, a local business group) claims that "increases in unwanted crime and grime, including a 64% increase in crimes against people and property in the past year, have pervaded the district and threaten Central Eastside's emerging reputation and business viability." Our findings dispute the CEIC's claim. Looking from 2015-2018 there is no significant upward trend in crime reports made in the Central Eastside Industrial District boundaries, and a comparison of all data available in 2017 and 2018 (January- October) shows only a 5.7% increase in crime reports. A time series model predicts no significant increase over the next year as well. Additionally, we request more transparency from the CEIC regarding data source and methodology, as this analysis does not replicate the crime statistics their proposal contains. When private security forces are invited to patrol public space, with none of the customary public oversight or accountability of public policing, historically targeted/over-policed populations are placed in a particularly vulnerable position. Across all crime types, the three neighborhoods of Hosford-Abernethy, Buckman and Kerns (together) saw a 2.2% increase in total crime reports from 2016 to 2017, and a 1.2% decrease in total crime reports from 2017 to 2018 (Jan-Oct). The CEID boundaries (above) are a subset of these three neighborhoods, crossing the eastside of all three, so data from the Central Eastside Industrial District is subsumed in this section. open 24/7 in all of Portland? In Portland, it is illegal to dispose of one's household waste in private or public garbage cans and dumpsters. Without facilities or services for legally disposing of their waste, many homeless residents struggle to manage their waste. The ability and desire to maintain clean spaces is undermined by frequent sweeps, which are often driven by public One Point of Contact complaints over cleanliness concerns. While the general population attributes trash on the streets as generated by houseless camps, according to Metro RID, 78% of illegal waste in the region is dumped on the streets by housed residents (Dooris, 11/13/2018). What Are The Reporting Public’s Main Concerns? 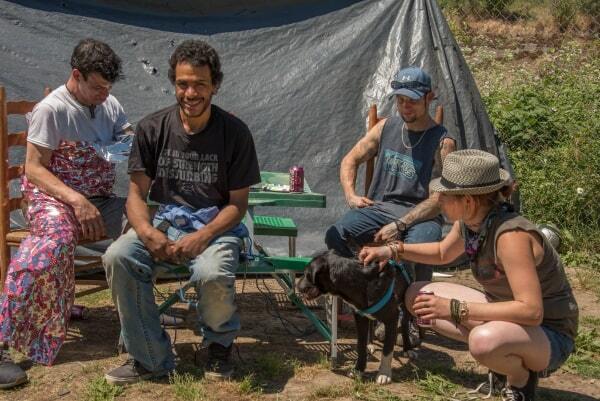 Returning full circle to our analysis of Portland's Camp-Eviction reporting system, we ask what concerns motivate the public to report camps for eviction through One Point of Contact? Of the seven issues the City lists in their reporting questionnaire the reporting public's top three selections are the presence of trash/biohazards (43%), misuse of public space (43%), presence of tents/structures (39%), followed by concerns about blocking the right of way, environmental damage. It is important to note that according to Metro only 22% of street waste is illegally dumped by houseless campers; yet they are typically blamed for all trash found near their camps (Dooris, 11/13/2018). Also, contrary to anti-houseless rhetoric, fewer than a quarter of public reports indicate "intoxication /drug use" and "aggressive behavior" as an area of concern. of all street waste collected by Metro is dumped by housed residents (Dooris, 2018). We are currently organizing to create a Compassionate Change District with a peer-run safe sleep encampment, a peer-run hygiene and bathroom access program, a safe parking program, and a peer-run waste management and pick-up program. To sign the petition of support and learn more go to ccdpdx.org. Dispatched Calls to 9-1-1 and Non-Emergency for Police. Portland Police Bureau Open Data. Crime Reports. Portland Police Bureau Open Data Portland Police Bureau Open Data. Campsite Reports. One Point of Contact Campsite Reporting System. Public Records Request. Map. Raw Campsite Sweeps. One Point of Contact Weekly Campsite Reports. Geocoded Campsite Sweeps (October, 2016 through April, 2018). Hack Oregon 2018 Neighborhood Development API. Methods report and code repo for geocoded sweeps and data analysis. Many thanks to our volunteers for GIS and data analysis. Questions ? Feedback ? Would you like to contribute ? Contact : n2npdx@gmail.com. We are a data collective of academics, analysts, and developers who want to make a difference at a hyper-local level, bringing information to neighbors and engaging in a transparent process with public agencies who contribute to policy decisions around houselessness.